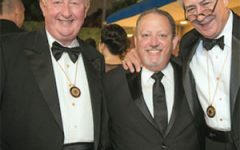 The Contemporary Design Group held its 12th annual Designers’ Gala and High Achievement Awards at the Alexis Park Resort, Las Vegas, on May 31. The Most Valuable Designer Player Award (which recognizes a designer who has created an indelible place in the world of designer jewelry) went to George Sawyer. The Best Designer Advocate Award (honoring an individual who has advanced the designer concept in the industry) was given to Sky Hall, and the Best Designer Retailer Award (recognizing a retailer who has excelled in selling and merchandising designer jewelry) went to Mary Helene Morrow of M.H. Reinhold in San Juan, P.R. The Best Designer Supplier Award, which was established in 1999, recognizes a supplier who has done the most to help designers grow their businesses. This year’s recipient was Myron Toback. The CDG also inducted Alan Revere into the Contemporary Design Hall of Fame, honoring him as an individual who has made outstanding contributions to the world of jewelry design.